Each year $662 billion in goods and services are traded between the U.S. and Canada. The healthy commercial relationship between the two countries represents strong business opportunities for companies on both sides of the border. Customs requirements, trade agreements, weather and regulatory changes can impact cross-border freight flows. As capacity tightens and trucking regulations increase, over-the-road (OTR) transportation is becoming a less reliable, less cost-effective cross-border freight solution. Savvy cross-border supply chain managers are realizing short-term cost savings and long-term risk mitigation through modal diversification. A multimodal or intermodal solution helps build a strong shipping network that can avoid disruption and single points of failure. The use of intermodal rail strengthens a supply chain’s transportation network by merging the economic and environmental benefits of rail with the flexibility of short-haul trucking. Deliver value for your company by diversifying your transportation plan and tap into the cost-savings and efficiencies of intermodal rail. U.S. and Canadian companies looking to tap into major consumption markets across North America can supplement their current truck-only freight moves with an intermodal service option. Shippers with distribution centers, warehouses and manufacturing sites within 240 km of Montreal should explore incorporating an intermodal rail solution into their network. 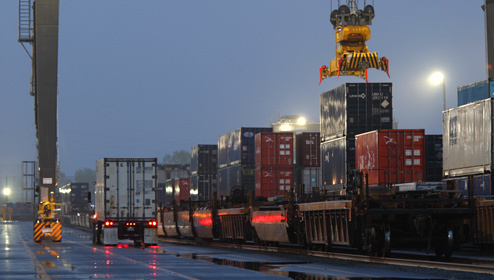 Intermodal rail provides cost-savings and productivity enhancements when moving freight over the border. When it comes to connectivity, CSX Transportation (CSXT) has shippers’ supply chains covered. The state-of-the-art cross-border intermodal terminal located just outside of Montreal is strategically positioned to provide cross-border shippers access to an ever-expanding intermodal network. 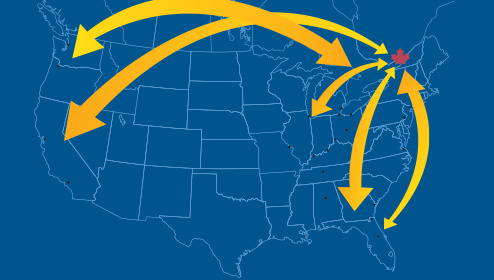 CSXT makes moving freight between Eastern Canada and the United States a seamless process.